Let’s get obligatory stuff out of the way first. Contra the blurbsters, Skyfall is not the best Bond movie ever made. 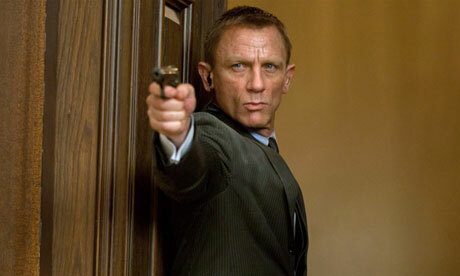 At 145 minutes, Skyfall’s pacing gets baggy at times. (Mission Impossible: Ghost Protocol, a comparable picture that runs 133 minutes, feels tighter.) And when the gamekeeper uses his flashlight to guide M from the smoking ruins of Bond’s ancestral home to the chapel, thus providing the villain with a beacon in the night, I thought either the gamekeeper is dumber than the movie wanted me to think he was or this was a thundering plot contrivance built for the convenience of the screenwriters and director Sam Mendes. Longtime Bond fans will recognize the elements of The World is Not Enough straight away: a villain bent on avenging himself upon M, M in jeopardy, an explosion at MI6 headquarters, MI6’s retreat to an HQ from a bygone era, and a Bond suffering from a significant shoulder injury incurred during the opening sequence. But the more significant influence is The Man With the Golden Gun with its hall-of-mirrors motifs, Chinese settings, highly specialized ammunition, as well as its villain’s girlfriend who becomes the villain’s victim after a 007 tryst, and its villain himself: Silva. Silva, like The Man With the Golden Gun’s Scaramanga, is a professional killer who does what he does because it pays well and because it amuses him. And while he, like Scaramanga, has other objectives, he can’t resist baiting 007 and finding ways to test himself against him. What I appreciated most about Skyfall was that it imported what made the ground situation of The Man With the Golden Gun compelling, while cutting away the latter film’s boring and utterly superfluous MacGuffin. Both films could be boiled down to “James Bond vs. The Superassassin” but the writers of The Man With the Golden Gun, in responding to then-current events, decided to add the Solex Agitator to the story, leading Bond and Scaramanga to pursue it instead of each other for most of the movie. Skyfall also responds to current events (Wikileaks), but keeps the story simpler. Silva wants to kill M, preferably after humiliating her first, so Bond has to hunt him down. This simplicity ratchets up the dramatic tension considerably in Skyfall, whereas the tension in The Man With the Golden Gun flagged badly when Bond and Scaramanga weren’t in the same space. I’ve been saying for years that a rewrite would have made The Man With the Golden Gun a great Bond film. It’s nice to be proven right. So see Skyfall, if you haven’t already. You’ll be amused and entertained.